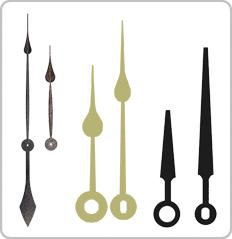 Since 1971 Clock Parts has been a manufacturer of mechanisms, inserts and dial faces. Our specialty in clock movements and motors coupled with all the necessary replacement components bring our customers the highest quality, advanced technology and affordable wholesale pricing. As a family owned private company located in Culver City, California, we have maintained a tradition of excellent customer service and quality components. Our quality is a result 40 plus years of experience of being one of the top rated manufacturers in the world. This experience has guided us in the designing and engineering of all of our components. Our customers look to us to bring to them new and inventive products that made their projects and businesses stand out. Our Auto Set movement is an example of this type of innovative approach. This movement has eliminated the need for atomic movements. One reason high torque atomic motors were used in projects was because they automatically adjusted for the spring and fall time changes. The problem with the atomic movements was the reliability of their receiver module to receive the spring and fall time changes and, thereby, make the proper time adjustment. Atomic movements’ receiver module and the AM signal broadcast has always been troublesome. Our auto set motor solved this problem. This motor allows our customers to build clocks that can be placed anywhere without the need for the movement to receive a time broadcast to display accurate time. The Auto Set motor has the daylight saving time changes programmed into the motor so it occurs automatically. There is no need to receive a radio broadcast. 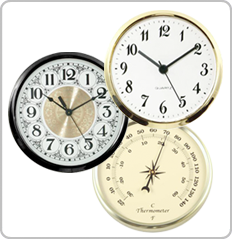 We offer an extensive line of clock movements. Our approach as a company goes beyond good engineering and design. A main focus point for us as a company is customer service. We are always concern on how well we provide customer service to our patrons. Our customer service starts with informative videos on our website to help and assist our customers in the proper selection of motors, hands and dial faces. Our blog section on our website provides additional information for our customers to read. We couple these informative blogs and videos with technical telephone support. Our comprehensive selection of battery operated quartz motors will make sure you have the perfect movement for your DIY project. This selection includes USA Made Motors. We offer nine different USA movements. These movements are ideal for the customers who want their project to have the Made in the USA label. Our Mini Battery Quartz Movement line is an extensive line ranging from time only motors to high torque motors, pendulum motors; auto set daylight savings motors, specialty motors, tide motors, chime motors and weather instruments. Whatever you are looking to accomplish we have the right movement for you or the right clock kit. Our high torque movements permit you to create a large wall clock. The other movements we offer allow you to create any type of novelty project such as a trains, kitchen or motorcycle clocks. Our pendulum and chime motors choices include single and double pendulums. Certainly a key factor in building a clock is the choice of hands. A set of hands is both functional as it is cosmetic. We offer a large selection of hour, minute and second hands. The selection includes Seiko continuous sweep second hands, a series of antique hands and hands for German high torque movements. Our hand selection includes different size hands, shape and length. The selection allows you to select the perfect set of hands for your project. Different DIY projects require different dial face options. To meet the plethora of DIY designs we provide different dial faces. We offer round metal dials to square dials. The dial face sizes we provide are the most popular and unique faces on the market. Additionally, we offer specialty dials to include; plastic, round tin, 24 hour movement, and reverse time movement dials. Please visit our dial face webpage to view all the different options we offer. This page may stir your creativity and provide you with some additional project ideas. Clock Inserts or Fit Ups were introduced to clock makers over 20 years ago. Fitups opened a creative alternative for hobbyist and professionals. These insert components allow for a contemporary design within a project. Our selection of inserts stands out from the competition both in quality and diversity. We have just released our new premium line of inserts. All of our inserts come complete as one self contained component; hands, dial, lens and bezel. They easily fit into a clock case with a pre-drilled hole. Please view the video to see the complete line of options you have. The Kits and Assortments category not only provide you with the special elements for your project but also bring forth your additional creative ideas so that you can add the finishing touches to any project or create a new project. 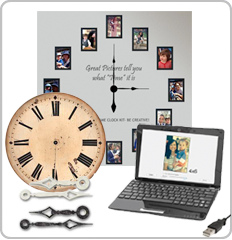 One of our most popular products is our large wall clock kit. This kit allows you to use large hands up to three and half feet wide. We offer both and Arabic and Roman Numeral numbering. Complete instructions and telephone support is available to make sure your DIY project is a success. Our clock accessories include items such as hardware, batteries, pendulum parts, stands, tools, etc… These accessories can turn a decent project into a great project. For example, having the right tool for the job is sometimes half the battle to complete the project correctly and easily. Our minute hand nut drive is one of those tools that make installing a minute hand easy. This tool makes tighten down the minute hand nut simple and quick. We also teach you how to make your own hour hand tool. We are one of the largest suppliers of clock components in the world and are happy to help! 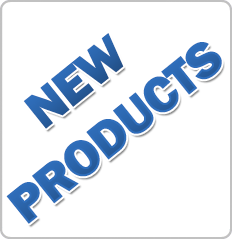 As an innovative company we pride ourselves in bringing new products and ideas to our customers. 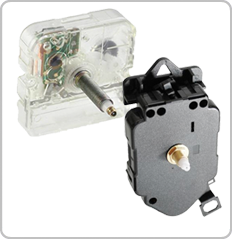 One such product is the reverse motor. This product lets you create a special barbershop clock. This unique motor runs in reverse looking through a mirror you can read the analog time display. We bring some exciting auto-set motors to your attention. These motors automatically adjust for daylight saving time. We also develop improvements in dial faces such as reproduction of antique dial faces. The DIY software will bring out the best in your creativity and you’re your project first in its class! Thank you for your consideration and look to us to help with all you project needs and be sure to check out our blog for additional information. Clock Parts is a manufacturer and distributor of clock movements, parts and mechanisms. 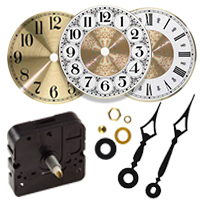 Offering electric, battery and quartz clock movements to replace or repair old clock mechanisms with new clock parts. 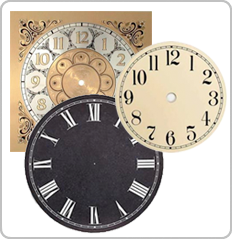 Check out our large selection of clock works, dials, hands, inserts, motors, movements and clock kits.